Tunganath : Chandrashila is the most easily accessible trek in high altitude of Uttarakhand Himalaya.On one side of ascending walk of 4.5 kilometre convey all age people to trek. Chandrashila 4000 metres high mountain peak just close to Gangotri great Himalayan range which is open throughout the year except heavy snowfall.All age tourist can enjoy the soft and pleasant trek in every season of the year. The splendid landscape and unique sense of trekking in Himalayas can be seen in this trek which moves through the Kedarnath Wildlife Sanctuary. 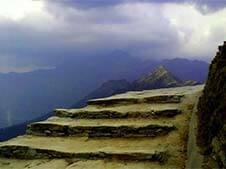 Easy access through motor able road makes this trek and ultimate destination for short duration visit. Day 5 :Relax at Base camp side or you can enjoy adventure sports - Rock climbing, Rappling, Balli ball Carom Board, Chess, ludo etc or Back to your next journey. Dist : Rudraprayag, Uttarakhand, India.